Maryland Gets Closer To Retiring State Song That Calls Northerners 'Scum' : The Two-Way "Maryland, My Maryland," written early in the Civil War, praises the Confederacy. State senators now have voted to reclassify the song as "historical." 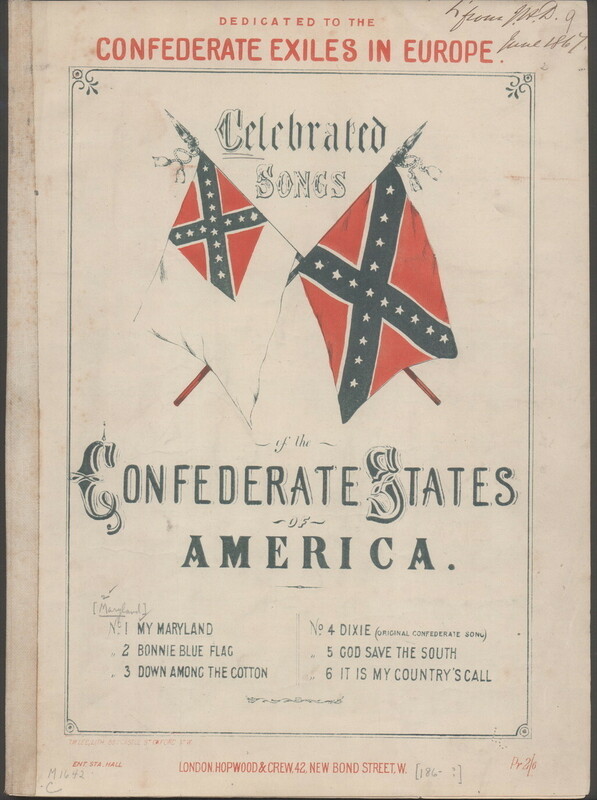 This image, provided by the Library of Congress, shows the cover of a collection of Confederate songs published in 1861, which includes "Maryland, My Maryland." State lawmakers want to retire it as Maryland's official state song but not erase it. State lawmakers who oppose Maryland's official song are getting closer to putting the Confederate-era relic out to pasture, even though they have had to put aside their goal of jettisoning it altogether. MD SB790, passed the Senate with a 30-13 vote Friday, and would reclassify "Maryland, My Maryland," as the state's "historical" song, rather than its official one. The bill says the song's words that "advocate the overthrow of the United States government and disparage Northerners and President Abraham Lincoln, are controversial, inappropriate, and do not represent the ideals and values of Marylanders today." Democratic state Sen. Cheryl Kagan introduced the bill last month and while it initially sought to repeal and replace the song, Kagan said the watered-down version is a "compromise." In a tweet, Kagan called it "a modest effort to address our outdated & offensive State Song," adding that it helps "address our racist past." Randall had moved to Georgia and his support of the Confederacy was clear. But even though Maryland remained in the Union during the war, it falls south of the Mason Dixon Line. The State Archives describes the somewhat ambiguous position Maryland held, saying it "was walking a tightrope between the Union and the Confederacy. In addition to being physically between the two sides, Maryland depended equally on the North and the South for its economy. Although Maryland had always leaned toward the south culturally, sympathies in the state were as much pro-Union as they were pro-Confederate." Set to the tune of "O, Tannenbaum," Randall's poem became a song, attaining popularity in Maryland and farther south, but it wasn't until 1939 that it was officially adopted as the state song. State GOP lawmakers have defended the song's historical significance. Republican Sen. Bob Cassilly told NPR in an email that while he disagrees with the Confederate cause Randall extolled, he said the poem also invokes the Revolutionary War. "I cannot help but be inspired by his poetic references to Maryland's history to justify a call to action and it is wrong to reject his contributions to our culture simply as a matter of ideological purity," he said. Senate Minority Leader J.B. Jennings, a Republican, dismissed the measure as "a participation trophy bill" and a "waste of time," reports The Baltimore Sun. But lawmakers in neighboring Virginia successfully voted in 1997 to retire their state song originally titled "Carry Me Back To Old Virginny" that was seen as a paean to slavery. In Maryland, attempts to revise or remove the state song are not novel. The Baltimore Sun reported in 2016 that lawmakers had revisited the song at least eight times since it was adopted. Efforts have gained ground in recent months, following the violence around last summer's white nationalist rally in Charlottesville, Va., and Confederate memorials being removed or shrouded elsewhere across the country. Last fall, the University of Maryland announced it was suspending performance of the song at athletic events and invited students to submit their own alternate lyrics for a competition to find a new state song. On Friday, Sen. Barbara Robinson, a Baltimore Democrat who backed the bill, told the Sun, "it's not changing history. History doesn't change." She added that demoting the song would be especially meaningful for black Marylanders. The legislation still has to be taken up in the state House, where its prospects are uncertain, according to the Sun. Senate President Thomas V. Mike Miller, a Democrat, told The Associated Press, the old song just needs to be put aside until the state can come up with a new one.